Here is a very special look into the mind of a creative genius. 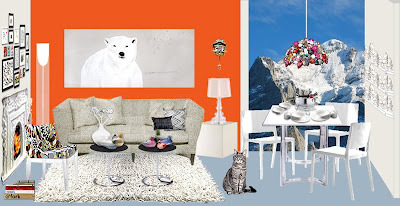 This is Jane Mount's plan for her "Downtown Chalet" being assembled at the 59th street Bloomingdales. A couple months ago she was asked by the folks at Apartment Therapy to design a window to be part of a small competition called the Big Window Challenge to help promote the relaunch of Bloomingdale's furniture department by designing a room with furniture from the new lines they carry. AND I'd like to point out that those gnomes on the right hand side are BROOKLYNrehab. OK most of them are. Are few are souless store boughts to help fill in the shelf. It takes a long time to make that many gnomes. Believe me I know. I first made them for Jane to be displayed on her reception tables at her fabulous wedding this past summer. I'll post some pictures from that later (If she approves of course). Ok enough text for now. Next post will be mostly pictures I promise.